Pandemic is a cooperative game, which means you won't have to defeat any of the other players at your table because they're all on your team. That's the good news. The bad news is that deadly diseases are quickly spreading all over the map and you'll have your hands full just trying to stay alive, even working together. 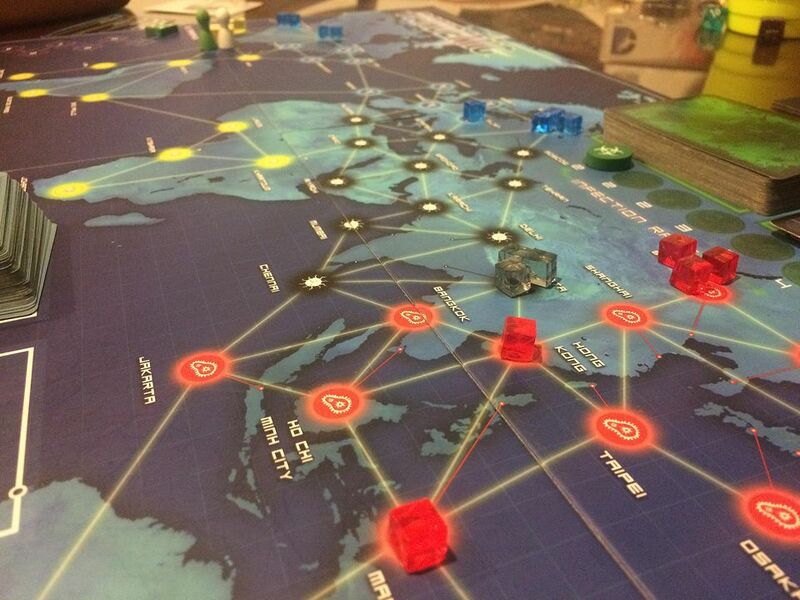 Here are some quick tips on how to avoid outbreaks in Pandemic. The game starts with three different cities that have three cubes each. If any one of these cities is not at least partially cured by the time the first epidemic rolls around, you have a very good chance of re-drawing one of them and triggering an outbreak. The danger is exponentially multiplied if any of your starting hotspots are adjacent to other cities that start infected. You don't have to remove all the cubes, but getting your opening three hotspots out of the danger zone should be high on your priority list when you start the game. Naturally, as the game progresses, more and more cubes will be added to the board. The easiest way to lose the game is to have outbreaks occur, so you'll want to keep an eye on any area with 2 or 3 cubes on it. Once a city gets the third cube, you'll want to cure a cube there as soon as possible, before an epidemic causes an outbreak and sends cubes everywhere. Remember, not only are the outbreaks bad because 8 of them will cause you to lose the game, but each outbreak also creates more cubes in every adjacent city—which can cause even more outbreaks if those cities were already hotspots. An ounce of prevention is worth a pound of cure. Or in this case, curing one cube in a hotspot now can prevent an outbreak from creating five new cubes on the board later. While it may seem intuitive to cure all the cubes in a city while you're there, it is generally more important to make sure that no city with 3 cubes stays untreated. This is the best way to avoid outbreaks. The Medic role is specialized for curing infection cubes, so if there is a Medic in your game, be sure that ability is used to the fullest potential. If your team needs to do a few things at once, the Medic should always be sent to deal with the 3-cube hotspots, as the Medic's special ability allows you to remove all three cubes for a single action. By sending your Medic to deal with the hotspots, you'll save valuable actions and clean out cities likely to accumulate more cubes. While anyone can cure a cube at a hotspot, the Medic is the best role for the job, efficiently curing cubes to help prevent an outbreak. In spite of your best efforts, it is almost inevitable that at some point in the game, you are going to have an outbreak. When an outbreak happens, don't panic. As long as you don't have eight of them, you can still win the game—the key is not letting outbreaks spiral out of control. When an outbreak happens, it spreads cubes to all adjacent cities. Many of these cities are likely to be cities you have not drawn yet, which are still in the infection pile. The natural instinct might be to think this is a good thing because you won't draw those cities and add another cube to them. But in fact, cubes in an undrawn city are the most dangerous. When an epidemic happens, you draw a card from the bottom of the deck and place three cubes there. If the city you draw happens to be one that has already picked up a cube, then boom, you have an instant outbreak. If, after shuffling, you then draw that city again, then boom, you have yet another outbreak. And with two outbreaks in a row starting in the same city, there is a decent chance a chain reaction may even cause a third or fourth outbreak. In order to avoid this double whammy and the unexpected post-epidemic outbreak, it is helpful to cure any cubes that have been placed in undrawn cities. This will ensure that if those cities are drawn from the bottom of the deck during an epidemic, they won't cause an outbreak unless they are drawn again from the top of the deck, and even then only one. It may be counter-intuitive to focus on the cities you haven't already drawn, but this will help keep you safer.